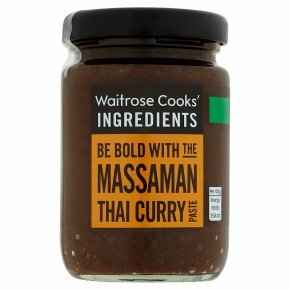 A massaman Thai curry paste with a unique blend of spices. Simply fry with coconut cream to release the rich flavours, then add meat and potatoes to create this creamy aromatic curry. Serve with rice and garnish with fresh coriander. BE BOLD WITH THE. MASSAMAN. THAI CURRY PASTE. Thai style curry paste to add rich flavour to Massaman curry.